If you have Yorkshire Terrier, then you probably are concerned about the kind of dog food is best for them. There are a lot of dog foods on the market, and choosing the right one for a particular breed can definitely be challenging. But the good news is that there are a few things that you can learn that will help you choose the best dog food for your Yorkie. In this buying guide, we will be looking at some specific brands and flavors of dog food that are perfect for this breed as well as cover health information, nutrition, feeding habits and all the other stuff you need to know about choosing the right nutrition for your Yorkshire Terrier. Now, let’s look at five of the best foods out there for Yorkshire Terriers. Dog foods can often be aimed at a particular size or type of breed such as a toy breed, but most of the dog foods out there will work for multiple breeds. There are some exceptions which we will be looking at below. All of these dog foods have been selected because they offer the nutrition and other factors that Yorkie dog food should have. 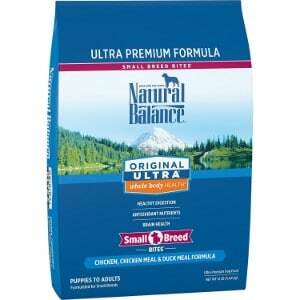 The first dog food on the list is this Natural Balance dry dog food for whole body health. When you’re looking for the best Yorkie foods, Natural Balance is one of the brand names that consistently rise to the top. 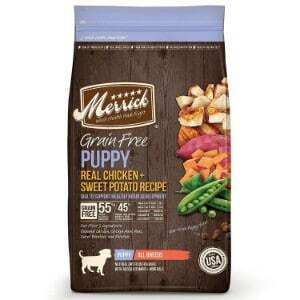 This dog food was created by expert nutritionists and it is made with real chicken, chicken meal and duck meal. It also features smaller bites because small breeds like Yorkies have small mouths. This dog food also approaches nutrition with the whole body in mind and is formulated for multiple life stages. It offers the best balance of high quality proteins without any of the fillers like grain, wheat or corn that some dog foods do. There are also no artificial flavors or colorings. Choosing a food like this that gives you multiple sources of high quality protein also gives you multiple types of fiber and provides a blend of antioxidant nutrients and the best omega-6 and omega-3 fat ratios. In addition, this dog food contains taurine for a healthy heart and healthy vision, terrific levels of DHA and EPA from fish to help your dog with healthy brain development and contains the proper levels of calcium, phosphorus, essential vitamins and minerals and much more. The nutritional profile of this dog food is perfect for Yorkies and offers whole body health so that all the internal systems of your dog run perfectly. 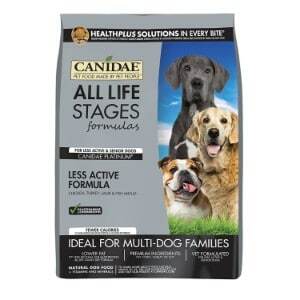 From CANIDAE comes this dog food that is intended for all life stages. It can be advantageous to have dog food that works for multiple life stages, because many people own multiple dogs and they all may be at a different stage. However, there are some advantages to going with a specific dog food for a specific life stages well. With this particular food, a large number of veterinarians have signed off on it, so it should be fine for puppies all the way to senior dogs. This dog food also offers premium ingredients including optimal protein and tons of nutrients that your dog needs through every stage of life. It is important to note that CANIDAE make specific dog foods for particular stages of life, and that this one contains 10 percent less protein and 27 percent less fat than some of the other foods that are specifically for adult dogs. However, the only time when that is going to work to your disadvantage is when you have a particularly active dog. If you have Yorkshire Terrier, then slightly reduced protein and fat isn’t going to make a difference because they do not burn enough calories to matter anyway. This dog food uses only the highest quality ingredients, with meat is the number one ingredient, and never uses fillers, grain, wheat, artificial flavoring, corn or anything else that low-quality dog foods use. Merrick is also a great brand and this puppy recipe is one of the best out there for Yorkshire Terriers as well as for smaller dogs of other breed. This puppy formula is completely grain free and it is made up of the top quality protein found at natural sources. That means whole food that is sourced from local farmers, making this an ideal dog food for puppies of every breed of dogs as well as for adult dogs that are one of the many toy breeds out there. This recipe is simply packed with nutrients so that your dog always gets exactly what they need and has all of the vitamins and minerals required to get through the day. In addition to the high quality protein, fat and vitamins and minerals that this dog food provides, it also features a really terrific taste that your dog will love. With deboned meat making up the bulk of this dog food, that’s what dogs are going to taste when they start chowing down. These are the same meats that they would love to have off of your plate, but they go in their own dog bowl and are stocked with all of the other nutrients that they may not get by eating your table scraps. This dog food comes in a 4-pound bag, 12-pound bag and 25-pound bag, and includes high levels of glucosamine and chondroitin for joints. 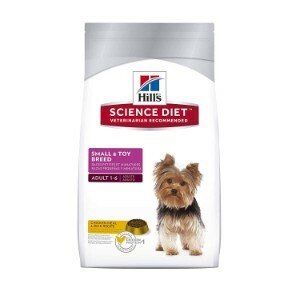 Hill’s Science Diet is one of the best brands out there for a high-quality, research-based diet and this dog food is specifically intended for toy breeds because of the smaller size of the kibble. You may notice that small breeds like Yorkshire Terriers can have trouble with some dog foods. But this dog food was not only nutritionally stocked with Yorkshire Terriers in mind; it was also designed to make it really easy for them to chew. In addition, this dog food provides antioxidants for immunity, including a blend that features vitamins C and E and helps support a healthy immune system specifically in smaller breeds of dogs. There are also multiple varieties to choose from including wet and dry food, lots of different flavors and food for different stages of life. This is biology-based nutrition that has research behind it and the reputation of a great brand as well. It always features plenty of protein for smaller dogs with meat is the primary ingredient, a taste that your dog will love, all of the vitamins and minerals that they need to stay healthy and the latest advancements in Yorkshire Terrier nutrition. This is a terrific choice if you have any of the toy breeds out there including Yorkshire Terriers. From Taste of the Wild comes this incredible dog food that will give your Yorkshire Terrier the energy and vitamins that they need to get through the day. 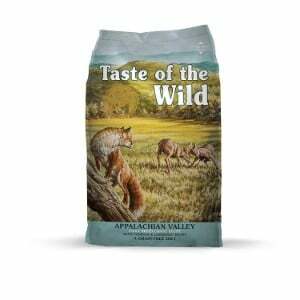 Taste of the Wild is one of the most respected brands out there when it comes to premium dog food because they tried to model the dog food that they create after what your pet would have been eating if he or she were still in the wild. This high quality dog food contains roasted meat is the primary ingredient but also includes a blend of different protein sources plus a taste that your dog will not be able to get enough of. It is packed with fruits and vegetables that deliver natural antioxidants to support your dog’s healthy lifestyle. Some of the things that you’ll find in this Taste of the Wild food include prebiotic fiber, optimal amino acids, and omega fatty acid blend, tomatoes, chelated minerals and of course the main ingredient and what gives this a delicious dog food its flavor – bison and roasted venison. There also some other flavors that you might want to try including smoked salmon, roasted lamb, beef, wild boar and duck. It comes in a 5-pound, 14-pound, 15-pound, 28-pound and 30-pound bag with no fillers like grain, corn or wheat, no artificial flavors or colors, no preservatives and it is extremely digestible on purpose because it is made for dogs like Yorkies that have smaller stomachs. When you want to buy dog food for your Yorkshire Terrier, you need to keep certain things in mind. There are a lot of factors that determine which dog food you should be getting for your dog. For example, you need to know what sort of nutrition Yorkshire Terriers require. This is close to the same as other dogs, but there are some differences to be aware of as well. You also want to know which ingredients to avoid. Finally, Yorkshire Terriers have specific health problems that they can suffer from, and diet can certainly affect how those health problems develop or are treated. We will be covering all of that in this buyer’s guide. There are a few things to understand about Yorkshire Terriers before you buy their dog food. This is the same as with anything else that you buy. If you are getting a dog crate, dog bed or dog house for your dog, you need to know how much room they need and what will be most comfortable for them. This is the same with accessories like a dog playpen or outdoor dog kennel. But when it comes to dog food, you need to know more than whether to buy wet dog food or dry dog food and what to look for on the label. This is the same whether you’re buying dog food for boxers, dog food for Huskies or dog food for Yorkies. Yorkies are one of the most popular toy breeds out there, and they are affectionate and playful plus obedient and easy to handle. They’re not quite as active as some of the other dogs out there, but they adapt really well to life inside a home or even a small apartment. They are often known by their nickname the your key, but they are actually called Yorkshire Terriers, and although they have a reputation for barking incessantly at a high pitch, they can be easily trained not to bark with a little work. Now, let’s look at nutrition. Nutrition for Yorkshire Terriers starts with understanding that you should always go with organic dog food whenever possible and definitely with grain free dog food. However, the first thing you have to understand about Yorkshire Terrier nutrition is that these dogs have small mouths. That means that you need to make sure that the food size is something that they can easily eat. They also have terrible teeth. That means that you may need to give them special treatment to make sure their teeth are healthy or get them in to see the vet more often because of their teeth. Smaller kibble can also work towards this goal as it scrapes tarter off of your dog’s teeth preventing buildup that can lead to diseases. Yorkies are less active than some breeds, but they do have high energy levels. They need plenty of fuel to burn, so you want to make sure to follow your breed recommendations as far as how many calories they should be eating. According to the National Research Council of the Natural Academies, Yorkshire Terriers require 150 to 200 calories a day depending upon how active they are. However, your key puppies will require twice as much food as adults. You also want to make sure that your Yorkie is eating several times a day instead of just once or twice. They have very small stomachs, and so they can only digest a little bit of food at one time. If you give them too much, they will experience gastrointestinal discomfort and other conditions from eating too much. Of course, you also want to make sure that you choose premium dog food that has all of the vitamins and minerals that your Yorkie needs to stay healthy. Premium dog food brands like the ones that were reviewed in this guide offer all of those nutrients for a healthy and happy Yorkshire Terrier. Getting the right ingredients is important whether you are getting food for small dogs or food for large dogs, and that includes food for stages of life such as puppy food and senior dog food. If you are looking for the healthiest food for Yorkies, then you want to be aware of the specific ingredients that should be present in your dog food. For example, protein should be the primary ingredient in your dog’s food. A healthy dog should be getting around 18 percent of their food from protein and it should be 22 to 23 percent if they are still growing. Crude protein should be the first ingredient on any dog food that you get. The second thing you want to look for is fat. Most people are not even aware of the fact that dogs require fat in order to stay healthy – a fact that humans also should keep in mind for themselves – and so do not look for the right fat content on their dog food. However, the truth is that healthy fats are terrific for your Yorkie and are vital to absorbing some vitamins. That gives your Yorkie fuel to burn wall playing and running through the house, it helps keep their coats shiny and their skin smooth and moisturized. You also want to be aware of carbohydrates. Your dog needs high quality carbohydrates because most of the fiber that they get is going to be included in those carbs. Some good sources of carbohydrates include peas, sweet potatoes and flaxseed. Finally, make sure that they are getting all of the vitamins and minerals that they require in their food. If you buy premium dog food that is specifically geared toward Yorkshire Terriers, or Terriers are included in the breeds that the dog food is intended for, then you will almost always get the right nutrition for your dog. You may also want to look at additional supplements, especially for senior dogs, like glucosamine and chondroitin. There are also certain ingredients to avoid, particularly if you need to choose dog food for sensitive stomachs, low-protein dog food for some conditions or dog food for allergies. This is a pretty simple rule to follow. You just want to make sure that there are no fillers of any kind in your dog food and that everything comes from natural ingredients whenever possible. Low quality dog foods will have fillers like wheat, grain and corn, while high-quality dog foods will always have freshly sourced protein, fruits and vegetables and the right combination of foods and nutrients to give your dog the healthy nutritional profile that they need. All you have to do is keep in mind that if it is not healthy and natural, then it should probably not be in your dog food. Some of the common health problems that Yorkies have can affect or be affected by the food that they eat. That’s why you want to be aware of potential health problems with your Yorkie. Like many toy breeds, Yorkies can suffer from some fairly serious health conditions. We have already discussed a couple of them above. Yorkies have more dental problems than other’s and even a little higher than other toy breeds. In addition to this oral health issue, Yorkies can also have sensitive stomachs and that can affect both the dog food that you give them and how you feed it to them. However, some of the other conditions that Yorkies can suffer from include hypoglycemia, a thyroid condition that causes weight gain and low energy levels, a collapsing trachea which must be treated with surgery but may be prevented by including glucosamine and chondroitin in your dog’s diet and Legg-Calve-Perthes Disease which is the degeneration of the back leg bones which will cause your dog pain and make it difficult to walk. You also need to be concerned with when you should be feeding your Yorkie. As previously mentioned, you should be feeding your dog at least three times per day. However, it might even be better to feed them four times a day if you can manage it. You also want to make sure that they have really small dog food that they are easily able to chew up and swallow. Yorkies have tiny stomachs and hypoglycemia can happen if you give them too much dog food once. If you don’t have time to feed your dog four times a day, then consider an automated dog feeder that doles out a specific portion on a schedule. The bottom line is that there are many things to keep in mind when it comes to the best dog food for Yorkies. You may have not even realize before that certain breeds need certain types of dog food, but the truth is, Yorkies in particular need you to select your dog food carefully. They need specific nutrients with meat is the primary ingredient along with the right balance of fats, carbohydrates and all of the essential nutrition like vitamins and minerals that their body needs. Your Yorkshire Terrier is a wonderfully active dog that can make a lifelong companion and is appropriate for even smaller living spaces. They don’t eat much, they are a lot of fun and they can even be trained so that the barking stops. But you have to feed them right if you want them to be healthy and hopefully this buying guide has given you some tips on how to do that.